What can you expect on a visit to these shores? Breathtaking countryside… More than just a strip of sand in the sea, this is the second largest island in the Caribbean with an ever changing terrain and non-stop unspoiled natural beauty. Raw nature… but you don’t have to rough it. You can be four-wheeling through jungle roads by day and, at night, be sipping sipping French wine and eating lobster in your cottons beside the beach. Not expensive … No matter your style of travel, you encounter relatively good value. With few exceptions, dining out costs US$8-$20 and local drinks are about $3 apiece. In other island nations prices are typically 30- to 50% higher than at home; here, virtually all local services and supplies cost the same, or less, than at home. from dozens of Canadian and European cities. Backpackers… Lots of pensiones, cheap hotel rooms and inexpensive public transportation. Easy hops from place to place with something different to experience at each one. Luxury… This destination attracts many very well heeled people who want to get away from all that. You won’t find Marriot or Sheraton but you do find some very exclusive and comfortable owner-operated small hotels and you can also rent million-dollar villas by the week. Most of the large resorts are predominantly filled with economy travelers on all-inclusive vacations; a handful are four-star. Meanwhile, you can get just about anything you want, from private car and driver to helicopters and yachts. All-inclusive resorts… There are dozens of all-inclusive beach resorts, where food, drinks, beach equipment and a long list of amenities are all part of a one-price package including airfare conveniently organized out of major European, American and Canadian cities. Lots of great deals available. excellent ranches), getting scuba diving certification (one of the least expensive places to get it), windsurfing (excellent schools for learning and all services for pros), white water rafting, whale watching (the largest Atlantic ocean gathering of humpback whales spawning January to March in Samana Bay), hiking trips (the tallest mountain in the Caribbean, Pico Duarte, 10,000 ft, with guides and mules available), mountain biking (bikes and guided tours for all levels), motocross and four-wheeling (dirt bikes and jeeps for rent and you’ll find endless, unmapped backroads). There are plenty of guided day trips and excursions that make it easy to have a tropical or third world adventure and get back to the comfort of your hotel by the end of the day. Relocating and Investing… Each year more people come and don’t leave. As one of our friends says, “my cost of living is equivalent to my tax and utilities budget back home.” People looking for a place to retire, or who simply dream of living in the Caribbean will find that there are a lot of good reasons. 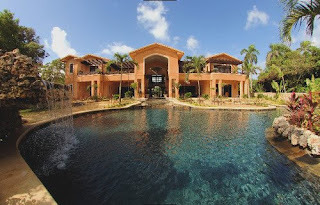 price and friendly people being the main ones, to consider this part of the Caribbean.
. This guide will help you find all of this and more. Have you already booked your trip? Don’t forget to get a free copy of our Puerto Plata Hot! Regional Visitors Guide that you can download to bring with you maps, coupons and local information that you will be glad you have once you get here! You step onto the dinghy dock. Luperon village is out of sight, but not out of mind, as you ascend onto a wharf built and maintained (somewhat) by the government of the Dominican Republic. Saint Dominic was surely the patron saint of amplified sound, and Gen. Gregorio Luperon, the liberator of guitar music: You can’t see the settlement yet, but you most certainly hear the boom boxes. So you march on wobbly sealers toward refrains of love lost, past the mangrove swamp, and into this not-so-sleepy village of 8,000 people. A building boom is under way, and the open-air welders on the edge of town are busy banging out decorative iron security gratings for homes of the prosperous. A wash dries on barbed-wire fencing, and a local fishmonger scrapes the neon pink scales off that morning’s catch; he’s getting old, and his tan face sports two-day-old white stubble. Naked brown toddlers chase chickens as grandmothers sit on miniscule front porches bemoaning the price of beans. Girls–formidable in styled hair, tight jeans and red lipstick–attend to their errands from the backs of motoconchos, the motorcycle taxis endemic here. You had planned to stay a week or two, but you lose the urge for going. Your boat throws down roots like a mangrove, and your anchor rode grows a coral reef. It happens all the time in Luperon’s harbor. It happened to me. Welcome to the flip side of the Americas. Goodbye, rational exuberance. Hello, magical reality. By May of ’99, I had a job. For the next year, I lived aboard and commuted to work in a shopworn Opel with three other resident cruisers. My Spanish started coming back, and I traveled the width and breadth of the Dominican Republic, a country about the size of New Hampshire and Vermont combined. During my stay I heard sea stories told by many a skilled mariner as they wet their whistles with fine Dominican pilsners. And I beheld a gaggle of expatriates. I met a Dutch sea captain who bought a hilltop where he’s building a splendid hacienda. I met a blind British spy, now retired. I met a former anti-Castro saboteur, two English con men and a professional poker player from California (a witty, easygoing, clean-cut fellow without a hint of Damon Runyon in his demeanor). I met a corpulent Canadian banker charged with money laundering; he beat the rap. I met a woman whose ex-husband was the ex-husband of the sister of a former vice-president of the United States; he was a rake and had absconded with the better part of wife No. 2’s inheritance. I met a South African couple raising two children aboard their 41-foot sailboat, whom I dubbed, despite their nationality, the Swiss Family Robinson. I met old men seeking young women, and pale women in search of dusky gods of the dance floor. I met a gringo lawyer who refused to sit on seat cushions because he thought doing so would cause germs to enter his body–plastic seats only, please. Former Fortune 500 execs were a dime a dozen. The lesser of the con men (I say lesser because of his mitigating streak of generosity) became a friend once he disabused himself of the suspicion that I was CIA. Last time I saw him he had concocted a hat trick of scams to finance his cruising. He was hawking pirated electronic charting CDs, advertising D.R. investment “opportunities” over the Internet, and offering to bring together love-hungry foreigners with Dominican beauties. I met a few delivery skippers on powerboats, but only one real cruiser under power; only about 35 of the estimated 700 yachts that stop in Luperon annually are power, and most of those are sportfish boats on delivery. The one cruiser I met was French via California. He was solo and on his way back to Florida from Saint Martin on a 26-foot Boston Whaler. He also had spent enough time buzzing around Cuba to be declared persona non grata by the Castro government. Where were all the trawler jockeys? If a crazy Frenchman in a Whaler–not to mention some kids in sailboats whose engines couldn’t be started since the Exumas–can make it from Florida to Luperon, why can’t you? Your boats are tricked out better than the U.S. Navy of 30 years ago. Regular fuel stops line the route all the way from Fort Lauderdale to Venezuela. Sorry to scold, but why aren’t more of you getting as far as Luperon in particular, and the Caribbean in general? Mom-and-pop retirees are getting there in sailboats by the scores, most of the time using those itsy-bitsy engines–that is, by motorsailing into the contrary trade winds. Luperon, on the D.R.’s North Coast, is a logical stopover on the “Thorny Path” from Florida to Anguilla, where the Caribbean islands take a turn to the south. Until Anguilla, boats from the United States are eastbound and therefore, dead nuts into the relentless trade winds. Add a few thorns for contrary prevailing currents and seas as well. Northern sailors avoid the Thorny Path to windward by voyaging to the Caribbean via Bermuda, thus making an “easting” in the high latitudes above the trades. For many of us short-legged diesel-sippers, however, Bermuda is less an option. Besides, cruising the length of the Bahamas, the Turks and Caicos is great adventure and a fine prelude to a completely different adventure–the Dominican Republic. It is a stunningly beautiful and varied nation; her people are among the friendliest folks you’ll ever meet. Farther down, Caribbean islanders resent your material wealth outwardly, but not in Luperon. In fact, Americans are preferred to Europeans because we tip and because so many Dominicans have family in the U.S.–some of them with well-known names like baseball stars Sammy Sosa and Pedro Martinez. Luperon, sometimes referred to as Puerto Blanco, is an extraordinary hurricane hole, made secure by surrounding hills and holding ground of anchor-swallowing gelatinous muck. Thievery happens, but is rare. Many cruisers wait out hurricane season in Luperon because of its shelter, but also because hurricanes avoid this part of the North Coast, tending instead to track through the Bahamas or, like Georges in 1998, pass to the south on the other side of the Septentrional Mountains. Unlike the Bahamas, the D.R. is a country best seen by land–a truism that affirms and enhances Luperon’s status as a great cruising destination. That’s because Luperon is the best staging area from which mariners can explore the entire D.R.–Santo Domingo included–whether by rental car or guided tour. Leave your prejudices behind, and the Dominican Republic will prove to be immensely amusing, filled with curious contradictions. On the practical level, everything you need to continue your voyage is either readily available or, with patient investigation, obtainable. This is crucial to cruisers heading west to Cuba, where supplies are short. For eastbound cruisers, Luperon is the place to hunker down and await a weather window. In these waters, that means a period of diminished trade winds and seas; otherwise you face a head-on bash to Puerto Rico with only one port to break up the trip–Samana, a nest of outboard motor thieves. Even in the pre-dawn darkness you can see the bold shores of Hispaniola from far at sea, one black mountain ridge dwarfed by a bigger, blacker one behind. After weeks in the salt-scrubbed Bahamas, your noses and tongues will re-acquire a familiar odor. It is the cumulative of soil, grass, trees, manure, cars and charcoal fires, but mainly just damp soil like your garden’s. As you near the waypoint above, the Hotel Tropical Luperon Beach Resort will stand out as white forms against the terrain. The harbor entrance is just to the east. Your next waypoint is 19°55.0N, 70°56.5 W, at 1/4 of a mile from the harbor mouth. Inside the mouth, a small headland extends from the eastern shore; from the waypoint, come in toward the tip of that headland on a bearing of 190 degrees magnetic. This will take you between occasionally breaking reefs on either side, which are marked (usually) by red and green balls. As you enter, the depth should level off at 12 feet then deepen. Before the headland, come right gradually, keeping between green and red stake buoys leading to the westernmost of the harbor’s two pools. Mangroves divide this pool in two parts with Marina Puerto Blanco’s docks to starboard and the government wharf to port. Mind the marks, motor slowly and watch for sandbars. For local knowledge, put out a call on Channel 68, which is monitored by every cruiser in the harbor. Channel 16, while not restricted to Dominican military use, is nearly useless because no one but the Navy listens to it. Entry procedures: Anchor anywhere with Q flag hoisted and wait for Dominican entry officials in a skiff; it is customary to offer them a cold soft drink. If they don’t show, dinghy to the government dock and walk into town. At the outskirts, to the left is a path leading to a small bridge and the hilltop naval outpost. The commandante will record your presence, giving you legal permission to wander about on land. The immigration officer will catch up with you later. Fees are $10 U.S. for the boat, $10 for each passport, a $5 harbor fee and $5 garbage and water fee at the government dock. The passport fee buys you the equivalent of a 90-day (renewable) tourist visa. As in Mexico, Dominican officialdom enforces an antiquated system of “despachos,” requiring cruisers to check in with the Navy and fill out paperwork at every port. In fact, cruisers are technically forbidden from visiting places that are not ports of entry. That may change by the time you arrive. As new marinas are developed, the Navy’s top admiral is pushing to establish a system of three-month cruising permits similar to what is done in the Bahamas. Go Navy. Beat bureaucracy. Charts: Incredible as it may seem, no large-scale government chart of Luperon exsts. Hispaniona 017 by Wavey Line Publishing, available at major chart providers, depicts a small-scale view of the Turks and Caicos, the north coast of the Dominican Republic and western Puerto Rico with several harbor charts on the backside. It’s an excellent chart, which includes waypoints, but again, Luperon is inexplicably omitted. Your solution is in the next paragraph. Van Sant, himself a denizen of Luperon, keeps his Schucker 440 trawler Tidak Apa in the harbor, while he and wife, Rosa, make their home a dozen steps up the hill from Puerto Blanco Marina. Van Sant long ago traded the real world, where he was an aerospace engineer, for the peripatetic life he has led since. Whenever he’s not cruising the Bahamas or Spanish Virgin Islands to update his books, Van Sant holds court–he would hate the phrase–at the marina restaurant, dispensing advice and debating politics. Easy to identify, Don Bruce likes to wear a white Panama hat, white shirt with French cuffs and cargo shorts. The “Gentleman’s Guide” is available at stateside marine stores or through Cruising Guide Publications at 727.733.5322; www.cruisingguides.com. British expatriate Julia Bartlett founded Flutterby Boater Services in association with Puerto Blanco Marina and it’s a clearinghouse of valuable information. She’s a bit of a legend, too, having single-handed across the Atlantic and cruised the Caribbean for years. Don’t worry about having to look for her or her associates; they’ll find you. If Julia’s not off cruising, she’ll be the blonde putt-putting up to your boat wearing butterfly wings, hence Flutterby. Fuel and water: While there are no gas docks anywhere on the North Coast, quality diesel fuel is available in Luperon. Ask Flutterby to help you arrange a delivery; small amounts will be jugged out to your boat; otherwise you can make an appointment for a fuel truck to meet you at Puerto Blanco Marina or the government dock. Fuel in the D.R. likely will be substantially cheaper than in the Turks and Caicos, your other refueling option thereabouts. Water is available at the government dock and Puerto Blanco marina, but it’s for washing, not drinking. Bottled water in 6-gallon jugs is sold at the marina. Marinas: Marina Puerto Blanco (809-571-8644) is more than a marina; it is headquarters for the cruising community. Owned by the Fernandez family and managed by Lenin Fernandez, it is a one-stop shop with bar and restaurant, drop-off laundry, garbage facilities, showers, water and car and truck rentals. 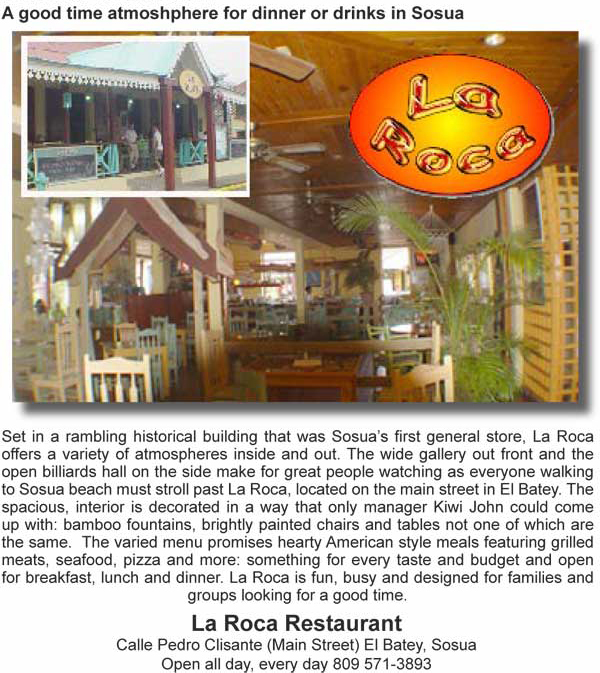 The restaurant menu is a balance of Dominican and gringo dishes–cheeseburgers being a favorite. The restaurant/bar puts on film nights, trivia contests, dance nights and, on Sundays, a boater’s flea market in the morning segues into an afternoon barbecue. Moorings: A couple of years ago the government placed moorings in the harbor, but my correspondents now report that many have broken loose and any remaining are best avoided. Provisioning: Luperon has three small grocery stores with basic provisions, one of which, Supermecardo El Sol, caters to cruisers by providing free delivery to the dock. A fresh vegetable truck visits the marina regularly, its arrival announced on Channel 68. Puerto Plata, the North Coast’s biggest city, has three large American-style supermarkets that offer most of the foods you’re used to, including high-quality cuts of frozen meats from the U.S. The inland city of Santiago has a supermarket bigger than I’ve ever seen in the states, but maybe I don’t get around much. If your vessel runs on beer, this is the place to get it. Presidente and Bohemia are the best in terms of quality and price for a thousand miles in any direction. Aged sipping rums by Brugal and Macorix are as smooth as fine brandy. A cruising couple, Brian and Margie, have opened a marine store on 27 de Febrero in town, advertising charts, filters, canvas repairs and courtesy flags. As in Mexico, many drugs sold by prescription in the U.S. are available over-the-counter in the D.R., including Viagra. Luperon’s Danessa pharmacy overlooking the village’s central square is a good place to stock up on antibiotics, seasickness preventatives and painkillers if you are continuing on . Crew changes: Puerto Plata International Airport is just more than an hour away, with several daily flights to New York, Miami and San Juan. A steady stream of European flights arrive carrying fodder for the area’s all-inclusive resorts. A cab ride from Luperon to the airport costs about $40. Communications: Codetel on Calle Duarte is the telephone office with direct-dial booths, fax and Internet service. Punto Internet on Independencia also offers email and Internet services as well as a host of computer services and photo developing. Music and dance: Dominican grandmothers bounce babies on their laps to the rhythm of meringue. Dominican teens dance as if their bones were made of rubber, but the moves are quite elegant compared to the “dirty dancing” you may have witnessed in the Bahamas or Miami. Mario Vargas Llosa, quoted at the beginning of this article, summarizes the relationship Dominicans have with music, but in his list of musical styles, he makes an all-too-common omission. Vargas Llosa fails to mention Bachata, a musical style enormously popular on the North Coast, though it is looked down upon by urban sophisticates who prefer the relentless dance rhythms of today’s techno-meringue. Bachata, characterized by plinkity-plink guitars and simple drums, is called the “music of bitterness” and is sometimes compared to North American Country Western. The lyrics bewail love lost, and the Dominican people seem to know every word to every song; they sing along with the boom boxes. It seems so romantic–and so unlike Dominican reality. To me, Dominican courtship is highly adversarial, like watching cats mate. Despite or because of that contradiction, I am a Bachata fan, and my favorite practitioner is Antony Santos, who reminds me of a young Frank Sinatra. Bachata and meringue can be heard at Luperon’s discos, including one next to the Luperon Beach Resort Hotel, which often features live performers. For a night out in the big city, have dinner at Café Cito (see restaurants), then check out Orion Discoteque, a world-class dance venue. Bring earplugs. And beware: Any establishment calling itself “nightclub” is probably also a whorehouse. Sights And Tours: Once again Flutterby is a good source of information, and Julia herself organizes regular horseback riding tours from Mario’s Ranch in Luperon. Horses are best for touring the area’s lush and otherwise inaccessible countryside. Mario will find a beast to match your skills as a rider because if you’re up to it, the sand flats are good for galloping. About 45 minutes down the road to Puerto Plata is the crossroads city of Imbert (which has the nearest ATM). 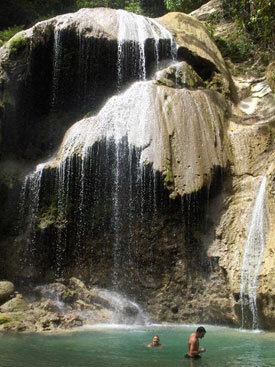 Just outside of town and set back in the forest are falls that will remind you of God’s own waterslide. A hired guide will help you alternately climb and swim up successive levels until you’ve reached your limit (four is usual, seven for the boldest souls). You then slide down granite half-pipes worn as smooth as polished marble by eons of rushing water, and leap into a deep pool at the base of the cliffs. Climb and slide take about a half hour. About 10 miles west is the seaside village of La Isabella, site of the first European settlement in the New World, founded by Columbus. Himself. There is a museum and ruins of the old Spanish fortress, which was bulldozed by mistake in the 1950s. There are several good tour guides in the Luperon area that can help you hire a late-model minivan and driver for an overnight trip to the capital or a visit to the mountains. In a day you can traverse lush lowlands, cross a desert and finish the day with mountain views, including Pico Duarte, the highest point in the Caribbean at 10,094 feet. Duarte is one of 20 peaks in the “Dominican Alps” higher than Mount Washington in New Hampshire (6,288 feet) or Mount Mitchell in North Carolina (6,684 feet). On one of those Dominican mountains, is the village of Arrastrando Tu Pierna, where there is said to exist a gravitational anomaly that allows the villagers to bounce around like squirrels and chickens to roost in treetops. Shopping: Bruce Van Sant’s wife, Rosa, operates a nifty little gift shop at the marina. Called the Dominican Treasure Shop, it sells high-quality jewelry and clothing. Rosa, who is Dominican, is a reliable source of local knowledge, and her shop has a boater’s directory of local suppliers and services compiled by boaters. The Dominican Republic is a mother lode of amber, some of it complete with an ancient insect inside. Larimar, another semi-precious gem, is found only in the D.R. It comes in colors ranging from sky blue to blue-green. This is nice stuff and looks great set in gold and silver. Cigars: Tim Hall is an expatriate Montrealer, a long-time refugee from the frozen north who wears several hats. 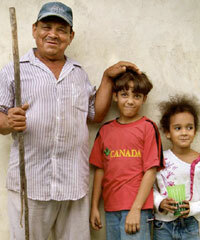 By day, he operates a Canadian consulate from a sidestreet in Puerto Plata. By night, he moves to the second floor where he runs Café Cito (a restaurant to be discussed later). Behind the consulate he maintains a well-humidified room filled with Cuevas Hermanos cigars. Hall took me on a tour of the Cuevas Hermanos factory on my last trip to the D.R., explaining in his gravelly voice that most Cuevas production is bought by famous brands and resold under their labels. 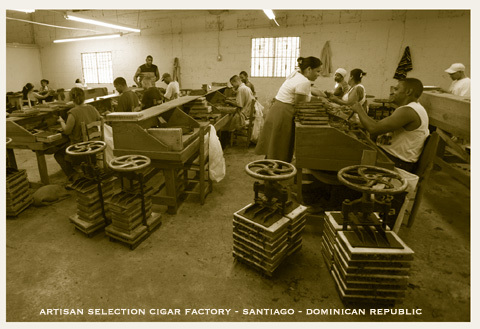 As dozens of workers rolled the aromatic brown leaf, light skinned, well-dressed caballeros walked the floor puffing puros. I was warned not to take their pictures lest some reader make the connection between this factory and whichever name-brand these gentlemen represented. Secretive bunch, these stogie-mongers. The D.R. 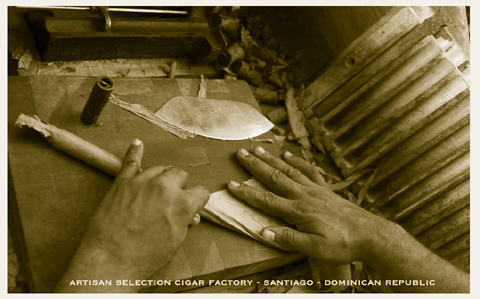 is one of the biggest cigar producers in the world, so you can expect to find cigars for sale around every corner–the good, the bad, the indifferent–often at disproportionate prices. Hall, in his effort to create a “cigar culture” for his restaurant, has honed in on the Cuevas house brands to ensure consistent quality. Because I don’t smoke, I’ve relied on correspondents to whom I provided a Christmas supply of Cuevas smokes for testing. “The Cuevas Habanos was a surprisingly good cigar, well-rolled with an even cool draw. Mild to medium bodied in flavor, it was an unexpected pleasure. The 1492 with its slightly darker wrapper turned out to be a top-notch smoke with perfect draw, great white ash and again, a mild to medium bodied punch,” wrote Wayne Chick, a New Hampshire newspaperman. “Good and smooth,” commented Ray Kucklinka, a New Jersey high school teacher. Hall wears a fourth hat. 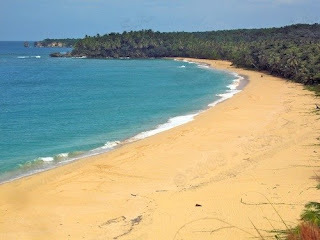 He operates an excellent website providing information on the North Coast of the Dominican Republic: www.popreport.com. Restaurants: Unlike Mexico, the D.R. is no dining destination. Dominicans eat a healthy, if monotonous diet of beans and rice, salad and small portions of fried chicken, pork chops, stewed beef or occasional fish. So popular is chicken with beans and rice, in fact, that it’s called La Bandera Dominicana, the Dominican Flag. Dominican food is OK as far as it goes, but what saves the cruising palate from certain boredom is the institution of mixed marriages. Several restaurants in the Luperon area are Belgian-Dominican or German-Dominican husband-and-wife teams. This includes El Belga, Pequeno Mundo and La Casa Del Sol. Conversations with boatbuilders suggest that most power cruisers, at least on the East Coast, aspire not so much to bluewater passages as those comfortable slides down the archipelagoes that lead step-by-step from the Florida peninsula to shores of South America. Island hoppers take a left at Luperon for the Lesser Antilles; a right for Cuba and the Yucatan. Luperon’s strategic position opposite the Turks and Caicos on the D.R.’s North Coast makes it an obvious component of any southbound cruising plans. The bonuses of such a layover are manifold, not the least of which is the potential for a rich cargo of memories, which in the end are all we have left worth a damn. My family and I started going to Cabrera, a quiet surfing area in the Dominican Republic, when friends took us there four years ago—right before my second daughter, Gigi, was born. We’ve been back 10 times since. Cabrera has always felt like our own secret spot, and part of me wants it to stay that way—even now, I’m not sure why I’m writing about it in a national magazine. On the other hand, it’s one of those places that’s so uncommonly special, you want other people to enjoy it, too. Located in the northern part of the country, Cabrera is paradise—but you have to appreciate that it’s not swanky St. Barths. It’s a more rustic, wild kind of paradise, and for me; my husband, Bill; and my daughters, Kit, 10, and Gigi, 4, that’s exactly the appeal. In New York City, we have a polished urban lifestyle, so a real getaway for us means something completely different. Generally we spend just four days on the island, Thursday through Sunday, but those days are action-packed—as in dawn-to-dusk action-packed. As nice as Cabrera’s Hotel La Catalina is (it’s a bargain, too, by the way, starting at $82 a night), we don’t spend much time there. Maybe we’ll take a dip in the pool or walk around the garden, but hanging out at a hotel all day feels too quiet, too normal for us. We’ve never been the relax-by-the-pool type of family anyway. Instead, we explore. On a typical trip, after arriving in the early evening on the four-hour flight from New York, we drop off our stuff at the hotel and head right to Playa Diamante. There, the girls and I cover ourselves head-to-toe in the claylike volcanic sand, which I swear has special beautifying minerals. (Bill thinks the whole thing is ridiculous.) Then we wade out into the shallow water to rinse off before heading to our favorite roadside stand for pineapple yogurt. Since Bill and I are avid surfers, we tend to spend at least one afternoon at Playa Grande, known for its waves. The water is usually too rough for the kids, so he and I take turns on the shore with Kit and Gigi doing, basically, circus tricks: cartwheels, human pyramids, swinging someone around in a towel. Maybe we’ll dig a hole. Beyond that, the activities vary. We’ve visited a fresh­water lake known as Lake Dudu (you can imagine the joke mileage the kids get out of that name), where we rope-swing out and splash into the water. We’ve hiked through a jungle, following a guide who hacks through it with a machete, to reach a fairy-tale cave with stalagmites inside and a banyan tree growing atop it. And on our most recent trip, we ended up at a restaurant called Babunuco, which an eccentric artist runs out of his house. You eat whatever he’s cooking that day and sit among the strange, beautiful objects he’s made—a whale-vertebrae stool, a bar made out of a surfboard. The restaurant is raw and magical—just like Cabrera itself. Lately we’ve started inviting friends and other families along, and everyone falls in love with the place. In fact, one friend who came with us last year loved it so much, she still hasn’t left. Run by artist (and cigar maker) Juan Alberto Garcia in a building next door to his home, this restaurant has unpredictable hours, so call ahead to make sure he’s cooking that night. The menu typically consists of delicious, simply prepared fish or meat, and there’s usually jazz playing on an old jukebox in the background. 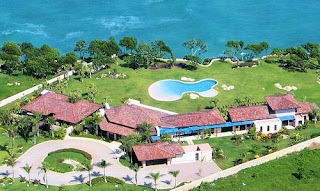 Camino de Saltadero, (829) 338-8707. At the 15 food shacks on the beach, you can order a fresh pineapple or coconut with a straw in it any time of day. At lunch, they’ll let you choose your fish or lobster, then serve it with a salad and rice and beans. (Kids—my kids, at least—will eat anything mixed with rice and beans.) The casitas are set among palm trees about 50 yards from the beach, but if you want to have a picnic lunch even closer to the water, they’ll bring your food and table setup there, too. A big part of a great food experience is the setting. I would never think to get pineapple yogurt at the grocery store back home, but at this roadside stand a short drive from Playa Diamante, it is just about the purest, most delicious thing you’ve ever tasted. Highway 5, La Entrada, (809) 669-2942. This well-run family-owned hotel consists of 36 rooms and condominiums. We usually stay in a one-bedroom condo, which is basic but comfortable: a simple kitchen and charming painted rattan furniture that reminds me of my ’70s childhood. The hotel is less than 10 minutes’ drive from the nearest beach and has beautiful gardens, two pools, a pond with turtles, and fantastic food—we always fuel up on the fresh juices and crepes for breakfast before setting out. From $82 a night for two adults and a child in a double in low season (June through October) to $168 a night for a two-bedroom condo in high season (November through May). Head to Diamante or Caleton for calm, shallow water; for surfing, try Playa Grande. (You can rent boards on the beach.) All the beaches are a drive of 20 minutes or less from the hotel, but be warned: Only Caleton has public restrooms. At the larger of the two swimming holes here, local teens dive from great heights (while we all scream, “Don’t do it, don’t do it!”). Our family often has the smaller one, sheltered by a cave, to ourselves. $2 admission fee; off Highway 5, La Entrada. A guide named Junior will bring horses right to the hotel and lead you on different paths. It’s very informal: Helmets are available, but there are no waivers or age requirements, so you ride at your own risk; Bill and I each double up with one of the kids. $20 a person for a one-hour ride; book through Hotel La Catalina. You can book an official tour at the dock, which is about a 30-minute drive from the hotel, but we just hired one of the fishermen by the water to take us on a ride. The lagoon is amazing, full of wild tangles of mangroves and the biggest vultures you’ve ever seen. Calle Duarte, Rio San Juan. The designer’s strategies for making any family vacation smooth sailing. 1. Start with the flight. When we were trying to find a warm-weather place for a long-weekend getaway, we first narrowed down our options by looking at flight schedules: Where could we fly directly and arrive by the afternoon? That’s how we initially homed in on the Dominican Republic. 2. Stay in the zone. We’ve taken big family trips to Japan and China, and I have to say, it’s always better to travel as close to your own time zone as possible. Otherwise the kids are up all night and sleep all day—which, of course, means the same goes for the parents. 3. Pack lightly (and creatively). To save time and avoid baggage claim, no one is allowed to check luggage, and everyone, even 4-year-old Gigi, has to carry his or her own stuff. We make a game out of trying to pack things that can be used several ways—I bring a top that Kit can wear as a dress; Kit brings a shirt that Gigi can wear as a dress; we all share sun hats … that kind of thing. 4. BYO fun. I always bring little notebooks and crayons, which keep Kit and Gigi entertained the whole time we’re away. It’s also a ritual that we let the girls pick out something special at an airport gift shop before each flight. It keeps them excited both as we wait to board and once we’re on the plane. 5. Let everyone call the shots. On the first morning of each trip to Cabrera, we sit down at breakfast and make a big plan—some activity, like fishing or horseback riding, that’s been on our wish list. Then we make the smaller plans: Gigi picks an activity, Kit picks an activity, and the grown-ups pick an activity.